Industrial Air Cooler Benefits of Air Cooler - Adjustable air quantities to suit all weather conditions - Les than 1/30 the cost of refrigerated air conditioning to run - Oxygen Rich Fresh Air delivered to you - All 100% fresh outside air - A complete Natural process BIG IN Cooling...SMALL IN COST!! Jinan Baifute Refrigeration Equipment Co., Ltd. This mini portable air conditioner can use a battery to be taken outdoor. This portable air cooler can be used also for your pets during summer. You can use portable battery or just charge it via USB. It is very economic as the the electricity that uses is only 2.5 watt. Measurements: 13.1*13.1*17cm Weight: 650 g. It has a water tank of 450ml that can be used for 4-6 hrs. Use battery of bigger than 10,000 mAh. Short on time? Let air-cooler sellers contact you. Spaceholod Imp. & Exp. 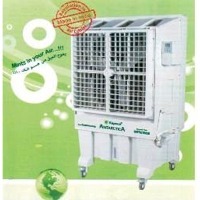 Co., Ltd.
We're the leading manufacturer of Evaprotive Air Cooler in East China. The product will cool,ventilate, and change the air. Single unit can cool the area up to 130-150 square meters and 5-10 degrees will be reduced, but the comsumption of electric is 1.1kw. We supply 3 phase 380V fixed & variable speed motor and Single phase 220v variable frequency speed motor which is the newest. The product is suitable for the manufacturing place, waiting area, exhibition hall, studio space, internet service, foodcourt, kitchen , laundry, livestock breeding an so on. It can be mounted through window or wall. The direct drive with eletric oscillating louver enlarges the cooling area. Many rooms in one building can share the cool by using the duct like as a central air condtioning. The protrudent characteristics of our product are energy-saving,economy,pro-environment and safety. I believe it has the huge market potential in your country and also you can radiate to the perimeter zones. If possible,we will set up the assemble factory in the future.If you are intrested and want more, you are welcome to visit our website www.windking.net . We are seeking a company who is reliable and capable for our agence in your country as our products are quite different from the disposable goods such as garments,shoes because besides the high quality, competitive price, we should supply the good after sales service. It's quite necessary that the partner we are expecting should own an engineering team which has experience and the sales network. We are expecting the cooperation with you. Main Features: 1.Combinations of cooling,ventilation,air-exchange,anti-dust,and savor-removal. 2.Environment: CFC Free, Nonpollution. 3.Automatic performance with LCD:Electronic control ,cleaning and water supplying antomaticly. 4.Energy-saving:lower daily cost Cabout one kilowatt per hour.Uses 80% less energr-much more economical than comparable traditional air conditioner C giving you tremendous savings. 5.Effectively and efficiently for cooling:5-12oC can be dropped in damp areas while 8-15 oC reduced in hot and dry conditions. 6.Great capacity of ventilation: Produces over 18000m3 of cooling power hour.Can cool areas up to 150m2 and can blow airflow as far as 30 merters away. 7.Option: Single phase various speed or three phase fixed and various speed. 8.Small investment but big effects:One workshop owning 100 sewing machines only needs about 6 units which costs 60% of the investment for traditional compressor air conditioners.All the investmens will be regained within 12 months. Applicable scope Manufacturing industries such as clothing , textile , the machinery , pottery , chemical industry , metallurgy , glass , five metals , leather ,etc. ; Processing industry such as electroplating , electron , shoes-making , printing and dyeing , plastics , printing , packaged food; Stadium , school , waiting room , super market , laundry , kitchen , food market , underground parking , greenhouse, poultry , flowers , animal husbandry ,etc. The principle of temperature drop: Water will absorb the heat from the hot air when steaming naturally. Its working principle: Extract wind through air blower, and the blower produces press, the air crosses the wet curtain, at the same time the water pump delivers water to the cloth water pipe on the wet curtain, and moisten the face of the whole wet curtain evenly, and the special angle of the wet curtain makes the water flow into one side where the air enters the wind directly, absorb a large amount of heat to lower the temperature through wet curtain, and filter it, which can make the wind nice, cool, moist and fresh. The water without evaporation falls back to the chassis forming waterway circulation. There are water level inductors on the chassis, when the water level lands to the fixed water level, it automatically open inlet valve to supply the source of water till the height of the booking water level, then close the inlet valve automatically. Parameter specification: Airflow(m3/h):18000 Power(Kw) :1.1 Voltage/Frequency(V/Hz) :380/50 Fan Type:Axle Motor Type:Three-phase Fixed Speed Controller Type :Intelligent LCD Capability characteristic: Injection shell is using modified PP composite materials and aluminum alloy column precision tectonic process; with the easy pull-out filters, wet screens paper of the frame protection and shockproof design, frame bearing capacity of 100 kg and above,with anti-corrosion, anti - ultraviolet, anti-aging15 years, high and low temperature resistance (subzero 20 fp C - 50 fp C) without distortion, and fuselage life for more than 10 years. LCD panel control system, using single-phase various frequency speed, three-phase various speed, three-phase fixed speed intelligent electronic control systems and closed all high-quality match for the electrical, intelligent sewage cleaned regularly, wrong phase, short phase, overload current, water shortages protection and fault alarm function. Adopt Sweden 5090-patented technology evaporative wet paper filter net , and the evaporative area in more than 85%; Using 3 leaves impeller, using silencers acoustic and noise reduction technology, the noise can be controlled lower than 56 dB. Product Description Applicable area: 30-50m2 With LCD and remote control; Noise: 38dB Voltage: 220V/50Hz(60Hz could be customized if ordered quantity is over 100PCS). Power: 280W Wind volume m3/h: 3500 Dimension: 620X440X1300mm Portable: 3 speed 360¿¬p WING(Right Left and Up Down) LCD and Remote Full warer can be used 18 hours. Unit Price/Payment: 100%TT Min. Order: 100PCS Transportation: by Sea Certification: CE Usage: Air Conditioner Type: Evaporator Export Markets: North America, South America, Southeast Asia, Africa, Mid East, Eastern Asia. Product range: Desert coolers: Winter, Jumbo, Sumo go Room coolers: Kaizen, Kaizen jr, Sumo jr,Jumbo jr Personal coolers: H! cool, Ninja, Ice cube Tower coolers: DiET 8T, DiET 22T, DiET 50T. Public places such as airport, train station, bus station, shopping mall, showroom, gymnasium, restaurant & bar, school, conference hall, shop-floor, canteen, office, recreation facilities, etc. Textile and clothing industry such as weaving factories, woolen textile factories, silk factories, socks factories, knitwear factories, cotton spinning factories, flax textile factories and garment workshop, leather industries, shoes-making factori Other places such as product storage, hot industry, greenhouse and stock-raising farm, etc. US technology, first class design in China Competitive price and excellent quality Big size cooling pad makes maximum cooling efficiency Fan made of full aluminum die casting makes noise lower LCD control,230 V/50HZ, 3-speed Mobile type with wheels and brake, no need for installation; can also be fixed on wall with supporting frame Easy to use and maintenance ABS plastic with UV protection body and components make the machine durable, lightweight Environment friendly. No CFCs used The less cost, low running cost Effective air cooling solution Ideally suited for the hot, dry religion climate, doors and windows can be left open Virtually maintenance free Introduce 100% fresh filtered air No sick building syndrome Cooling pad size:1100í- 100í-1175 MM Net Weight:60 Kg Gross Weight:65 Kg. The first class motor Much lower price Effective cooling area up to 30-50 square meter Low energy consumption Very quiet fan, noise is only 53/58/63 dB. Excellent LCD display Speed adjustable, high, medium, low Automatically swinging diffuse Full function remote controller Bigger water tank Works using tap water, also can connect cooler water inlet to water tap with a pipe No installation, no duct work design Easy to use, easy to clean. Maintenance friendly. Dimension:850*470*1280 MM Packing Dimension:920*560*1430 MM Net weight:32 KG. Model: AZL18-ZS10B(top discharge) AZL18-ZX10B(down discharge) Wind Volume at 0 Pa:18000 m¬°/h; Wind Pressure(Pa):190	Power(kw):1.10; Voltage): 220 50/60Hz Rated Currency(A):5.6; Noise(DBA):í-76 Fan Type: Axial Net Weight(Kg):90/84 Wind Speed: single-phase/ Various Speed Intelligent network control Optional) Auto Cleaning Water Lack Protection.